The Cotswolds AONB Hare Trail 2018 runs from 22 May - 9 September. There are over 130 Hares to be found all over the cotswolds. We are delighted to be the proud sponsors of Raymond the Rambler and welcome him to Kingshill House. Raymond is a Special Springer Hare and was designed by Chris King and his extremely talented daughters Grace and Florence. Being a Rambler, Raymond will spend some of his weekends going on his travels out and about in the local community. Watch this space for more on what he gets up to. I am settling in nicely here at Kingshill House. The staff are lovely and the house is amazing. I have been given the grand tour of the house and am now settling into my lovely little alcove and awaiting my visitors. Yay!! I got my first visitors today. A lovely young man called Joe and his mum. Joe is 9 years old and lives in Cam. Joe's mum said they are hot on the trail and have seen a few hares around Dursley and expect to go further afield over the coming days. Joes mum took an interest in the house and said she is going to get Joe to do a school project based on the house. The staff here have told me to tell you Joe that if you want a tour of the house give them a call and they will arrange it. Change of scenery for me. I have been taken down to the Oldridge Bar where I will stay for this Friday night (8 June) and Saturday 9 June. Huge excitement!! I am off on my travels this weekend. On Saturday 16th June in the morning I will be putting in an appearance at Cam Hopton C of E primary school where they are holding their annual summer fete and then in the afternoon I am off to rock it with the locals at CoaleyFest. Right I am belted up and ready for this Hare-Raising ride with Beth. Ok we are here, Cam Hopton C of E primary School. They have been really generous and supplied me with a bale of straw to sit on (and if I get a snack attack I'm sorted). I was very excited to see so many colourful stalls and noisy children! my lovely straw bale is right in front of where the band, the Disclaimers, are going to play. It was a bit windy and we had a shower of rain, but nothing distracted the children from the many things to do … including live ferret racing! The band were excellent and my companion, Beth, happily sat alongside tapping her feet whilst enjoying a lovely hot pork roll – supplied by Cam Family Butchers. Right so Beth and I have just rocked up at Coaley School playing fields to enjoy a spot of outdoor music at CoaleyFest. The sun had come out now (whoop whoop) and lots of children are playing on the bouncy castle, the racing cars and lining up to get their faces painted. Loads of children and adults were very interested in coming over to say hello to Beth and I, it was fab, I have had a brilliant day!! Beth took me out again today. After a short ride in the back of the car, we're at Tortworth Lake for Tortworth VC Primary School's summer fair. What a fantastic location, but very warm. As you can see from the picture I was quite tempted to jump in and cool off! Thanks for inviting us along for a lovely day. Today Beth and I went to Dursley Carnival. We met up with Tracy (Our lovely PR lady) and went on to have a great fun-filled day. There was fairground rides, live music, hot air balloon rides and all the wonderful folk from the community had stalls. 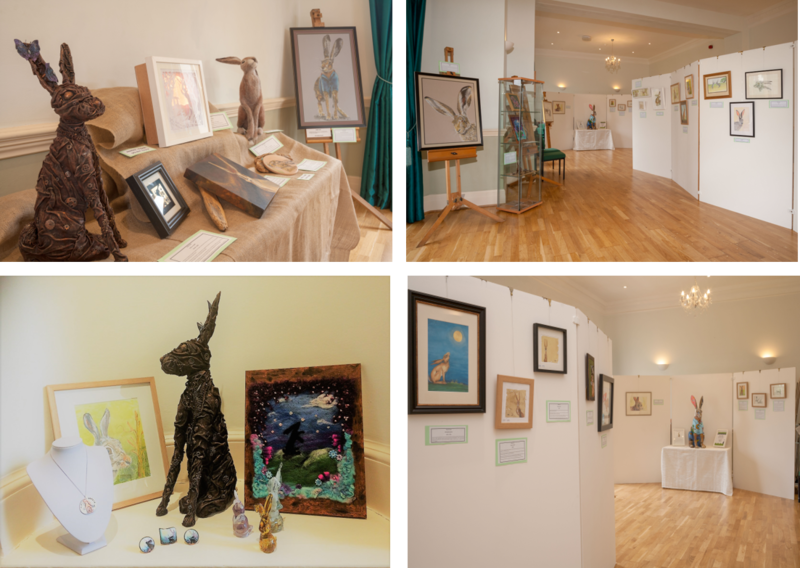 I am very excited as Kingshill House are hosting a multi-media Hare Exhibition in my honour! Who’d thought there were so many talented people out there in Dursley and the surrounding areas .. Artists have been dropping their work off over the past couple of weeks, and today has been the busiest ever … poor old Kate in the office, she’s been run off her feet and she’s desperately trying to put Artists statements together ready for the big day … the exhibition opens on Wednesday 15th August from noon and runs until Friday 24th August. Beth says we have over 55 pieces of art to go on display, from traditional watercolour paintings, to pen & ink and needle-felted pictures, plus free standing sculptures, jewellery, stained glass, blown glass and mosaics … and it’s all about me, little old me! Here I am with Ragtaggle Huffinpew: A Steampunk Hare and there’s another photo of my new chum Finn, he’s a needle-felted hare! The multi media Hare Exhibition was amazing, Just look at the amazing images below. I am so happy to have inspired so many talented artists...Little ole me...wow! We had loads of visitors who oohed and ahhed over the fabulous pieces of work on display and some people even bought some of the work.. Anyway I am now back in my little alcove until the 9 September then I am going off to auction to help to raise funds for ​the Caring for the Cotswolds visitor giving scheme and Glorious Cotswold Grasslands. He will be missed by all of us here at Kingshill House but dig deep and show your support for two fantastic Cotswolds Area of Outstanding Natural Beauty landscape projects: Caring for the Cotswolds and Glorious Cotswold Grasslands.